What’s It Like To Plan A Thru-Hike In Six Months? When people ask me about hiking the PCT, I’m often asked how much it costs to hike it. How much does it cost to take five or six months off from life to live on a dirt trail? How much money did I save for my hike? How much money did I spend for my hike? How much money did I spend on gear? I have tried answering this question multiple times. After shooting three separate videos for my YouTube channel trying to answer this question, I finally came to the realization that there’s no one answer to this question. For as many hikers as there are, there are that many different budgets. 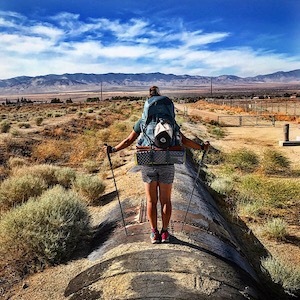 Everyone has a different concept of what they think is enough money to hike the PCT. Instead, I wanted to talk about what my life has been like over the last five months since I got off trail and how the process has been with only having six months to plan my next hike. For those of you who might not know, I’ve been planning my return to the Pacific Crest Trail this year in April ever since I finished my first thru-hike last year on September 27th, 2018. When I planned my first thru-hike, I gave myself a year to do all of the planning, not only figuring out details for being on trail like the gear I’d be using and my resupply strategy along the way, but also life logistics that would enable me to stay on trail for five or six months. Even with having a year to plan for my 2018 hike, I still worried it wasn’t enough time. Then halfway through my hike last year, I decided I wanted to come back in 2019 and hike the Pacific Crest Trail all over again, this time with my boyfriend, Bleeder, whom I met on trail during my first thru-hike. Planning back-to-back thru-hikes has not only been life consuming, but it’s probably been the toughest thing I’ve ever had to do. Spoiler Alert: The process hasn’t been easy. There’s been plenty of challenges to overcome and sacrifices made, but I know once I get back on trail in April, all of the hard work and sacrifices I’ve had to make will be worth it. If you like the video, be sure to hit the “Thumbs Up/Like” button. If you haven’t already, be sure to subscribe to my YouTube Channel, The Hungry Hiker to get notified whenever I upload new videos, making it super easy to follow my journey along the PCT this year. One of the big projects I’ve been working on over the last five months has been creating my YouTube Channel, The Hungry Hiker. This year, I’ll be documenting my hike along the PCT through more videos. Your support is everything to me so thank you! Are you inspired? Want to be an active part of my 2019 PCT thru-hiking experience without having to take a single step? CLICK HERE to learn how you can be a Trail Angel for my thru-hike this year.